The Accidental Locavore has been kicking this recipe around since I first saw it in Food & Wine. It had lots of my favorite things (artichokes, Jamon Iberico) and a rice I’d never heard of, bomba. Getting the ingredients together took a little doing and was definitely worth it (see the notes at the end). It may like a lot of steps, but it will give you a good jumping-off point for future meals and it’s up to you whether or not you do them all. Feeds 4. Preheat the oven to 400°. Squeeze the juice from the lemon halves into a large bowl of water, but save the cut halves. Working with 1 artichoke at a time, snap off the dark green outer leaves, until you get to the tender, lighter green inner leaves. Cut off the top of the artichoke, leaving about ¾” of the remaining leaves. Peel and trim the bottom and stem of the artichoke. Halve the artichoke and scoop out the furry choke with a spoon. Cut the artichoke hearts in half again, rub all the surfaces with the lemon and add to the bowl of lemon water. Repeat with the remaining artichokes. Drain the artichokes and pat dry. In a large, ovenproof Dutch oven, heat 1 tablespoon of the olive oil. Add the artichokes and a generous pinch of salt. Cook over moderate heat, tossing occasionally, until just starting to brown, about 4 minutes. Add 1/2 cup of water, cover and steam the artichokes until just tender, about 12 minutes. Transfer the artichokes to a plate and wipe out the skillet. If you are making the pesto: spread the pine nuts in a pie plate and toast for about 7 minutes, until fragrant. Set aside. In the Dutch oven, heat 2 tablespoons of the olive oil until shimmering. Add the onion and cook over moderate heat, stirring occasionally, until just softened, 5 minutes. Add the chopped ham and tomatoes and cook, stirring occasionally, until the tomatoes break down and the mixture thickens, 15 minutes. Meanwhile, in a medium saucepan, bring the chicken stock to a simmer and keep hot. Add the rice to the skillet and stir to coat with the tomato mixture. Stir in the hot stock, spread the rice in an even layer and bring to a boil. 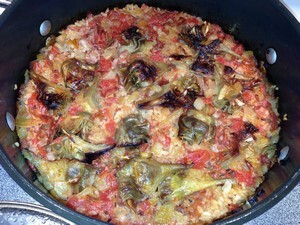 Place the artichokes in the rice. Cover and bake for about 20 minutes, until most of the stock is absorbed. Uncover the skillet and bake for about 10 minutes longer, until the stock is completely absorbed and the rice is tender but moist. Remove the skillet from the oven, cover and let stand for 10 minutes. Meanwhile, if you’re making the pesto, in a blender, or food processor, combine the parsley, pine nuts and garlic and pulse until finely chopped. Slowly pour in the olive oil and puree until nearly smooth. Season the parsley sauce with salt. 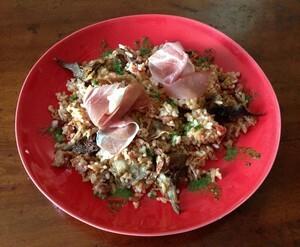 Serve the rice straight from the skillet, drizzled with the parsley sauce, topped with the sliced ham and enjoy! My verdict: Warning, this is delicious, but although it looks like “peasant” food, it is never going to be a bargain dinner! We were both pleasantly surprised by the bomba rice, it’s definitely worth seeking out (or order it from Amazon). I’m pretty sure you could use frozen artichoke hearts, without a huge difference in flavor. By the time the fresh artichokes I used were steamed and then cooked in the rice, they had lost a lot of texture and flavor (which I didn’t think had gotten picked up in the rice). I would thaw the frozen hearts and add them in when you uncover the pot of rice, for the last 10 minutes of cooking, and skip all the cleaning and cooking steps. Since I’m writing this in January, good tomatoes are impossible to find, so I used 3 canned, San Marzano, plum tomatoes. While we were enjoying it, we were talking about other ingredients that would be good in it. Olives, chorizo (Spanish style), chicken, and mushrooms were all contenders. You could just use it as a basic recipe, like a Spanish-style risotto and experiment. I made the parsley sauce and it was fine, but you could easily do without it.